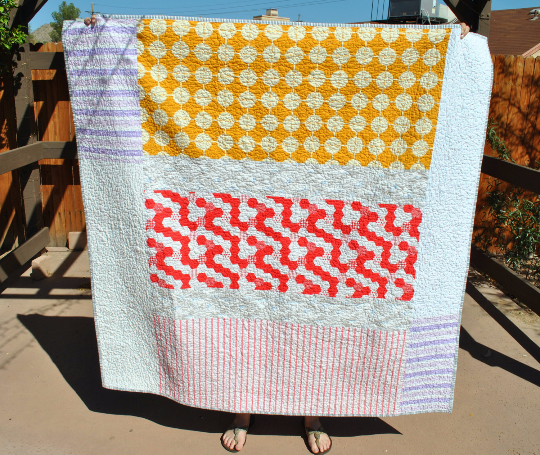 The Crooked Banana: A Finished Quilt! Yes, you read that right! I finished a quilt! I made this on commission for a customer through my Etsy store. I don't really sell quilts there anymore- I'd like to focus on knitting/crochet accessories- but this customer bought a quilt from me last year and asked if I would be willing to make another. So of course I said yes! 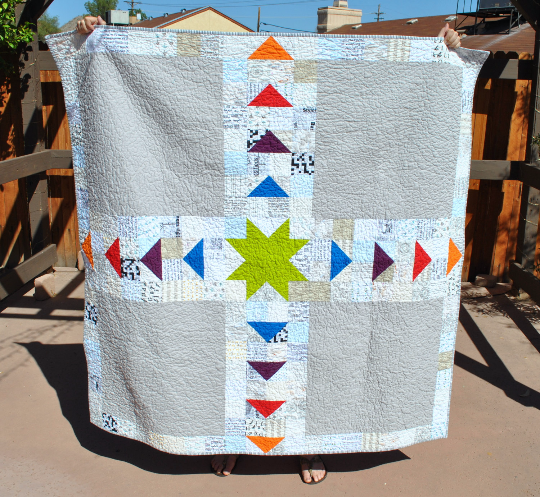 I really love how this quilt turned out. I drew up the pattern myself, but it's fairly simple. I star in the center with flying geese radiating out from it on a background of low volume squares. It measures about 60" x 60" and I quilted it with an all over meander (for speed, mostly, but I just love the way this quilting pattern crinkles after it's washed!). I love it so much I'm just a little sad it's already sold. Maybe I'll have to make one for myself? Lovely finish :-) The crinkling of the quilting is just right.